Harbor Freight Tools is a privately held discount tool and equipment retailer, headquartered in Calabasas, California, which operates a chain of retail stores as well as a mail-order and eCommerce business. The company has over 900 stores in 47 states. The company employs over 17,000 people in the U.S. In 1977, Eric Smidt and his father, Allan Smidt started Harbor Freight and Salvage in a small building in North Hollywood, California. The company began as a mail-order tool business which dealt with liquidated and returned merchandise, and changed its name to Harbor Freight Tools. In 1985, Eric Smidt was named president of the company at the age of 25; he served under that title until 1999, when he became CEO. From the mid 1980s-2010 Harbor Freight was headquartered in nearby Camarillo, California. The company subsequently acquired US General in 1991. [US General Supply Company, based in Plainview, NY, was another mail-order tool and equipment company which at one time had forty retail stores before they were all closed down soon after bankruptcy. Vestages of the old US General can be seen with the branding of the toolboxes.] At first, the company mailed promotions in standard #10 business envelopes. In the early 1980s, the company relocated to Camarillo, CA, acquiring the former headquarters of Unity, another large mail-order company, and launched its first mail-order catalog in the mid-1980s. In 1980, Harbor Freight opened its first retail store in Lexington, Kentucky, to sell returned merchandise from its mail order business. The original location was at 1387 East New Circle Rd. It later moved to 1301 Winchester Rd., Suite 213. The venture proved successful, and Harbor Freight began to open stores across the United States. As of August 2018, Harbor Freight operates over 900 retail stores in 47 states. Harbor Freight sells many in-house tools sourced directly from manufacturers. Harbor Freight tests their tools in their own quality assurance facility located in Calabasas, California, which opened in 2010. Harbor Freight's first website went online in 1997. It had a modest catalog of products, a brief "About Us" section and an order form for the printed catalog. There were also links to a customer service page with delivery times and return policies. In all, the original website had 10 landing pages. The current Harbor Freight Website has over 78,000 indexed pages. It had over 43 million unique visitors in 2012, mostly within the United States, according to compete.com. Harbor Freight Tools is headquartered in Calabasas, California. The company expanded marketing, merchandising, and other support systems when it relocated to a 90,000-square-foot (8,400 m2) facility in September 2010. 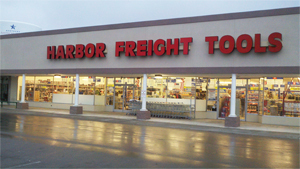 Harbor Freight has distribution space in Camarillo, California, Moreno Valley, California and Dillon, South Carolina, and is scheduled to close on another facility in Oxnard, California in early 2013. On April 4, 2013, Harbor Freight Tools announced a $75 million expansion project for the Dillon distribution center, which opened on November 22, 2015, adding 1 million square feet to the facility and 200 new jobs. In 2012, Harbor Freight, through Credit Suisse, secured a $750 million loan to refinance existing debt and fund a dividend for the company’s private shareholders. On January 9, 2013, CEO Smidt, through Harbor Freight Tools, donated $1.4 million of tools and equipment to the Los Angeles Unified School District’s (LAUSD) Career Technical Education. The donation was presented to LAUSD Board President Monica Garcia and Executive Director Michael Romero at the East Los Angeles Skills Center and Occupational Center in front of an assembly. Later in the same year, Harbor Freight Tools expanded its Tools for Schools program by donating a $100,000 gift of tools and equipment to South Carolina schools. In February 2018, Cedars-Sinai announced a $50 million gift from Eric and Susan Smidt and The Smidt Foundation to create the Smidt Heart Institute. So far, the gift is the largest donation in Cedars-Sinai's 116-year history. Harbor Freight Tools was sued by a group of its store employees in 2012, who alleged that they were misclassified as "exempt" from overtime payments as "managers," under the Fair Labor Standards Act. Harbor Freight won a declassification of the class action; that is, the court found that all the individual situations were not similar enough to be judged as a single class, and that their claims would require an individual-by-individual inquiry, thus that the case could not be handled on a class basis. ^ How Does Harbor Freight Sell Great Quality Tools At The Lowest Prices?